We do all jewelry repair and refurbishment in-house and combine the latest technologies with decades of experience. 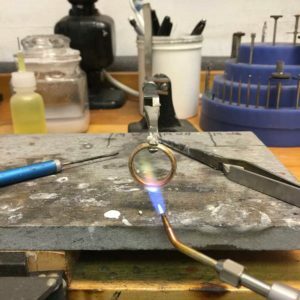 Our five full-time jewelers have a combined over 75 years of experience, and we routinely invest in continuing education classes and seminars to keep our jewelers up to date on the latest tools and techniques. 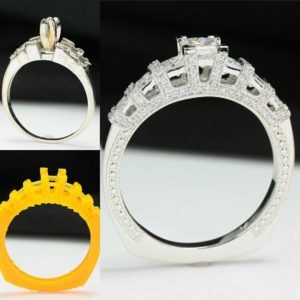 We have two laser welders for direct metal to metal fusion with minimal heat, which is critical when working on platinum, filigree and vintage items, and near stones that cannot tolerate the heat required for a standard torch and solder fusion. Each bench is outfitted with microscopes, torches, and all the necessary tools and equipment to perform the best quality repairs. From simple watch batteries, to complete watch overhauls, we will take care of your watch repair and maintenance needs. Do you have watches sitting on a shelf that aren’t running because they need a battery? Bring them to us so that you can start wearing them again. What about a watch keepsake from your family that isn’t running? It’s probably special to you… how much more special would it be if we could get it running again for you? We recently had a client wanting to update her current wedding ring. It was a traditional graduated princess cut design, and she was ready for a change! We were able to create a stunning custom design created specifically from her original diamonds, but in an exquisite, updated concept. We love being a part of all our client’s special moments!